IN THE EAST LONDON borough of Tower Hamlets 53% of children live in poverty - the highest rate of any English local authority. Against the threat of Tory government cuts that would slash a further £58 million from council revenue by 2020, the Labour-controlled council is looking to squeeze early years and special educational needs and disability (SEND) provision. The proposals have met with strong opposition from community groups and trade unions. 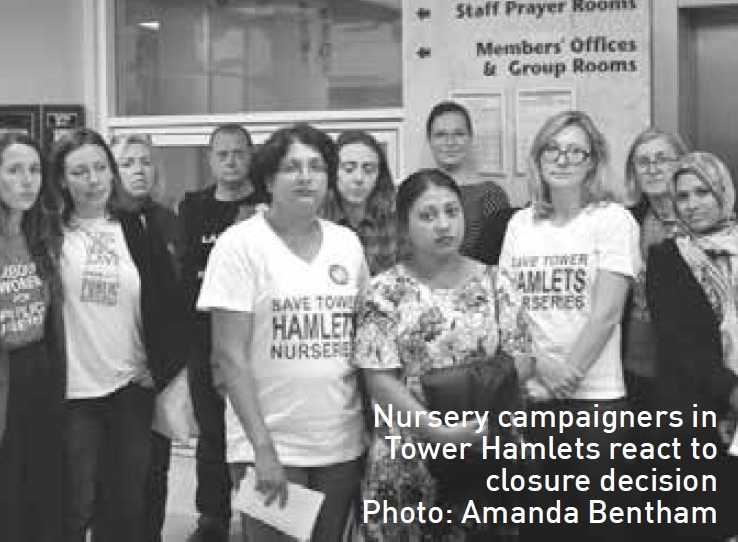 Despite this, at the 31st October cabinet meeting, mayor John Biggs reaffirmed his decision to close the borough’s three remaining local authority day nurseries (LADNs) after the initial decision was referred back mid-month following a determined campaign by community and Unison activists. Biggs’ decision disregarded the strong feeling generated by the local campaign to save the nurseries. Its organisers, who have joined forces with campaigns to save LADNs in Salford and Nottingham, have gained support from MPs Rebecca Long- Bailey, Angela Rayner and Barbara Keeley. They proposed a short-term solution of using council reserves to fund the nurseries for a year while seeking alternatives, as agreed in Salford. But Biggs, heading a council with a secure Labour majority, has not relented. Tower Hamlets set up the three day nurseries - Mary Sambrook, John Smith and Overland - to provide “an integrated education and day care service for the most vulnerable children in the borough”. All three nurseries have extended hours, stay open during school holidays and operate in tandem with early intervention services for parents. Campaigners estimate there are more than 100 children awaiting LADN places. Campaigners will be submitting evidence to the all-party parliamentary group for childcare and early education chaired by Tulip Siddiq MP, which is launching an examination into the sustainability of the childcare sector from 14th November. Currently around 8,000, or 17% of the borough’s 47,000 children and young people, get extra help for SEND and many beneficiaries of early intervention at the LADNs have gone on to thrive in their local schools with the support of the borough’s support for learning service (SLS). A threatened £1m cut to the SLS’s £2.4m budget could see the elimination of eleven specialist teacher jobs with hugely damaging consequences. The service, established in the early 1990s, currently provides specialist support and training to assist schools to include pupils with a wide range of SEND throughout the borough. Specialist teachers work directly within educational settings and with the families of babies and pre-school children who have a diagnosed hearing loss or visual impairment. Outcomes for those pupils have vastly improved over the last two decades and currently compare favourably to those in neighbouring boroughs, where pupils with SEND are much more likely to be excluded from school, to become ‘NEET’ (not in education, employment or training) and/or be criminalised. Cuts to the LADNs and SLS will disproportionately affect BAME and disabled children, sparking more legal challenges from parents, an increase in out of borough school placements, and, ultimately, associated costs to the community. Local National Education Union members are calling on Labour Party activists and Tower Hamlets councillors to work with them to build a local campaign against all government cuts to schools and particularly SEND.